Anybody else reading this blog live in Canada? Are you reading this during Winter 2013-14? Then enough said. I’m sure you’re going as crazy as I am. This winter has been the absolute worst. Non stop freezing temperatures. More snow than we know what to do with. Give us a break and bring an early Spring, mmmkay Mother Nature!? In order to mentally escape from this winter’s reign of terror, I’ve been thinking a lot lately about gardening. 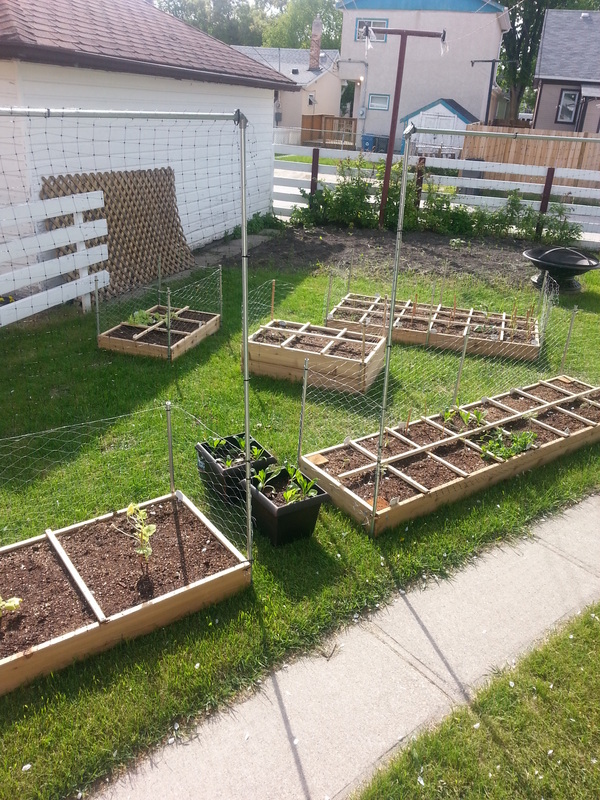 Last summer was the first opportunity I had to finally start a garden of my very own. 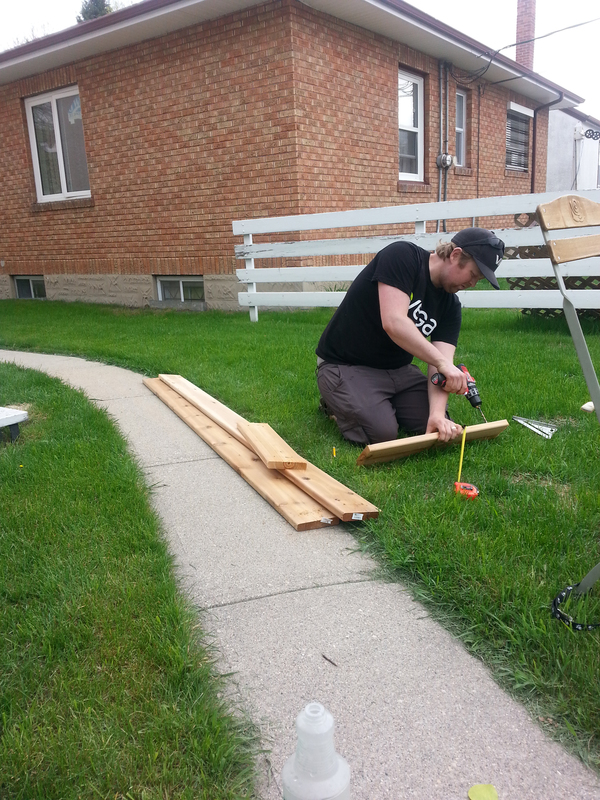 We finally had a house and a yard of our own, and I wasn’t about to wait another year (after MANY years of apartment living) to get going, even though we had been in the house under 6 months and were mid-bathroom renovation. 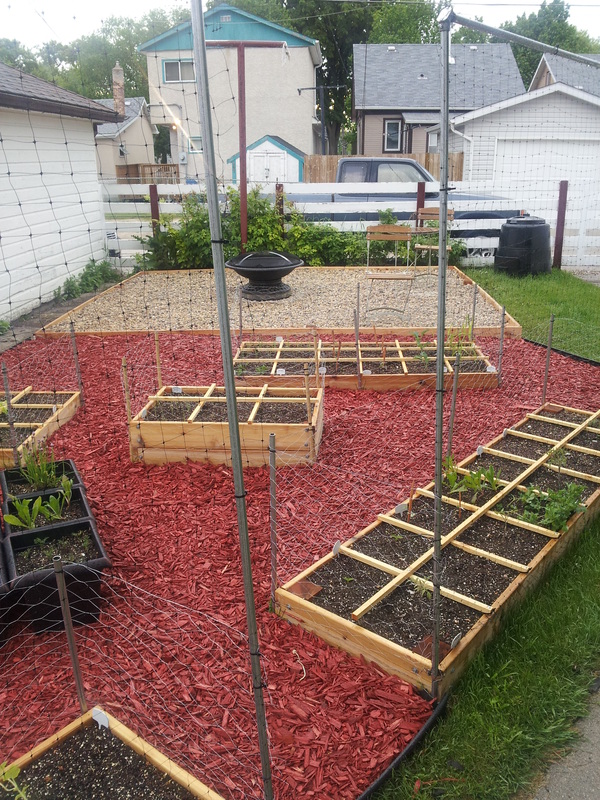 So my husband and I researched, planned and executed our garden. We were so happy with the result, I wanted to share the experience with you all! 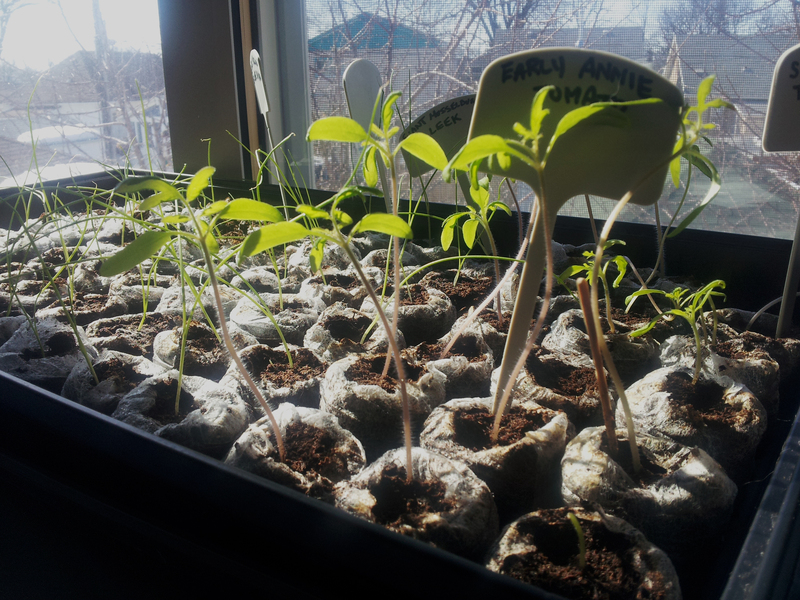 I hope it inspires you to grow something, no matter if it’s on a large or small scale. We started our gardening research with a book called All New Square Foot Gardening, by Mel Bartholomew. If you are considering growing anything, whether you have a tiny amount of space, or have a huge yard, get your hands on this book! I think it is the best resource you can use. If you follow the method in this book, I can pretty much guarantee you will actually enjoy gardening. All it really takes is a proper set up, and most of the rest of the time is spent enjoying it. It is not only efficient, but you do not have to worry about learning how to improve whatever existing soil you might have. You don’t need to own a bunch of gardening equipment (who wants to go out and buy a rototiller!? ), fertilize, spend hours bent over weeding, and you can scatter your garden around as you wish instead of having one big boring row garden at the back of your yard! 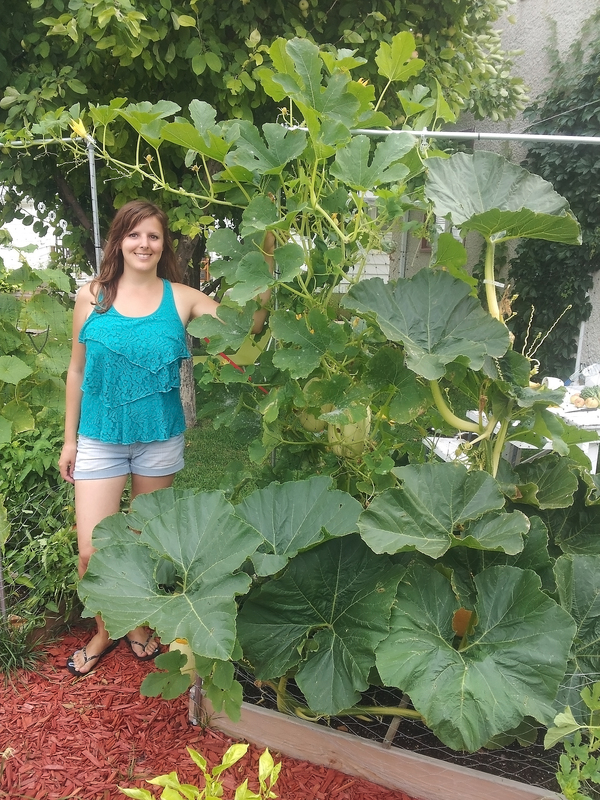 So once we decided we were going to create a square foot garden, we needed to plan how much we wanted to grow and where we could grow it in our yard. After some Google searches on garden planning tools, I came across an online garden planner software. The one I used is GrowVeg.com (I have no affiliation to this company – I am sure there are other planners out there, this is just the one I use). Although a tool like this is not necessary, I found it to be really helpful, especially as a gardening newbie! We decided that we would need a total of five boxes of varying sizes. Two of them would have trellis for anything we needed to grow vertically. 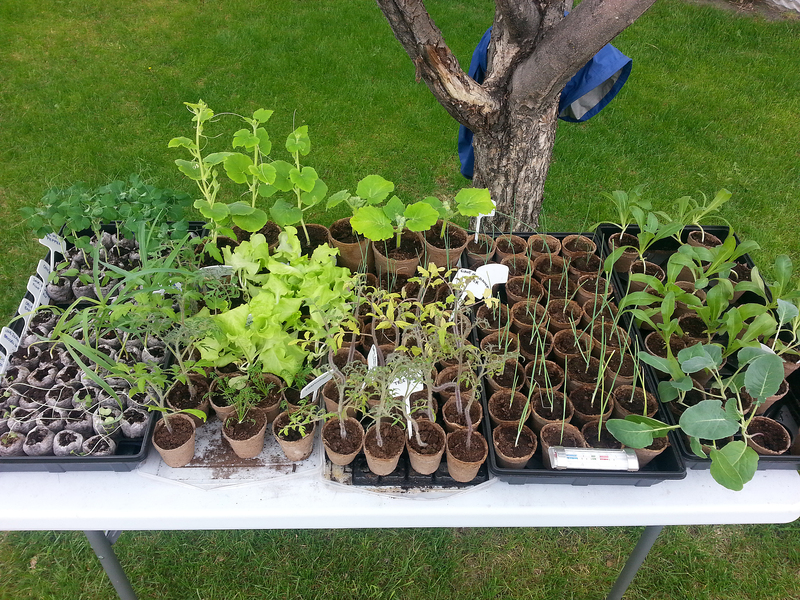 We also decided to grow a big variety and to start everything from seed ourselves. I realize this may have been quite ambitious for our first time at all of this, which the book even warns against – and it might be for some, but my husband and I are the “go big or go home” type people. We wanted to just go for it. After all, we had been waiting for this opportunity for many years. If you are overwhelmed by going big or a lot of work the first time, then start small. You can always build up your garden and your knowledge over time. Do what works for you! Once deciding on what we wanted to grow with the help of our garden planner, next we searched for a source for seeds. 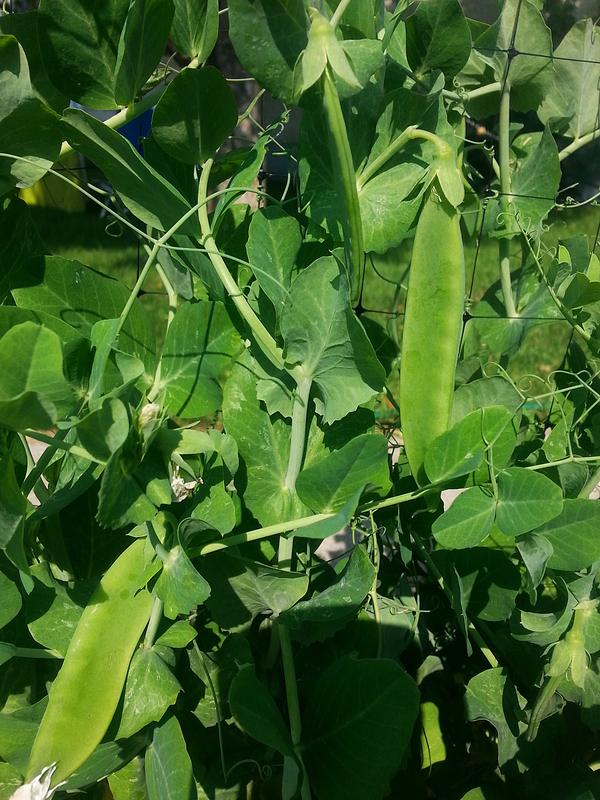 We found a local heirloom seed company offering organic, untreated, non-GMO , open pollinated seed. Wonderful! And since we used the GrowVeg garden planner, we began receiving emails to let us know what seeds to start indoors, and when! How awesome is that? It definitely made our ambitious plans go smoothly. 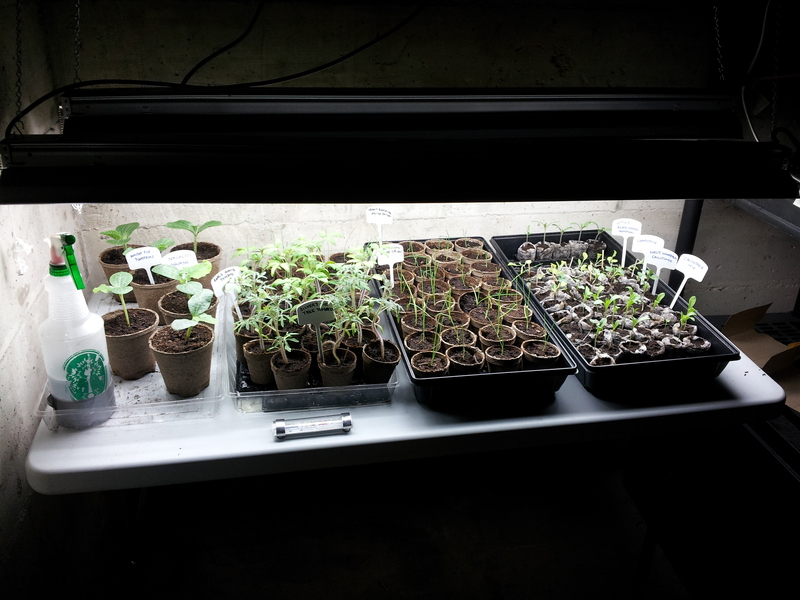 We made a set up in our basement with fluorescent lights, small heater, fan and a table and got our seeds going in the necessary phases. Everything we started from seed worked! It was a great feeling of success. 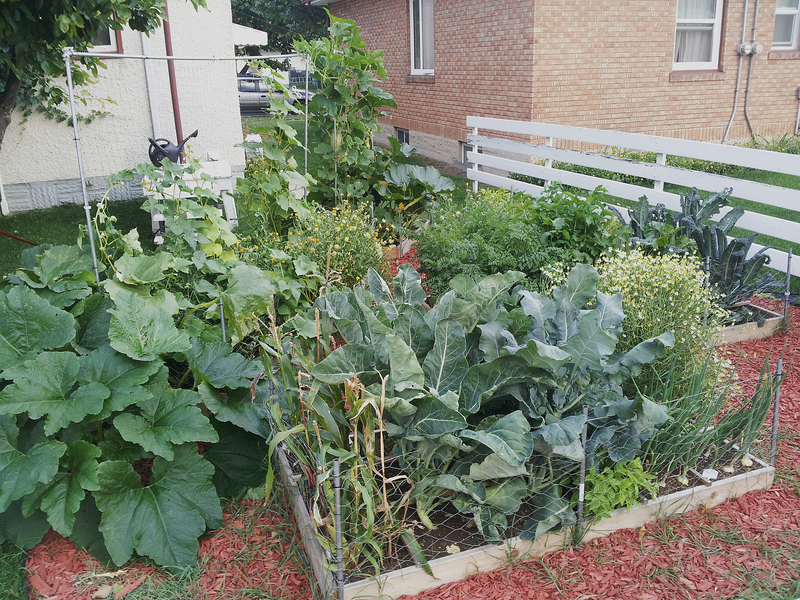 The most important component of getting our garden going properly with the square foot gardening method was the soil blend made of 3 components, called “Mel’s Mix” by the square foot gardening book. 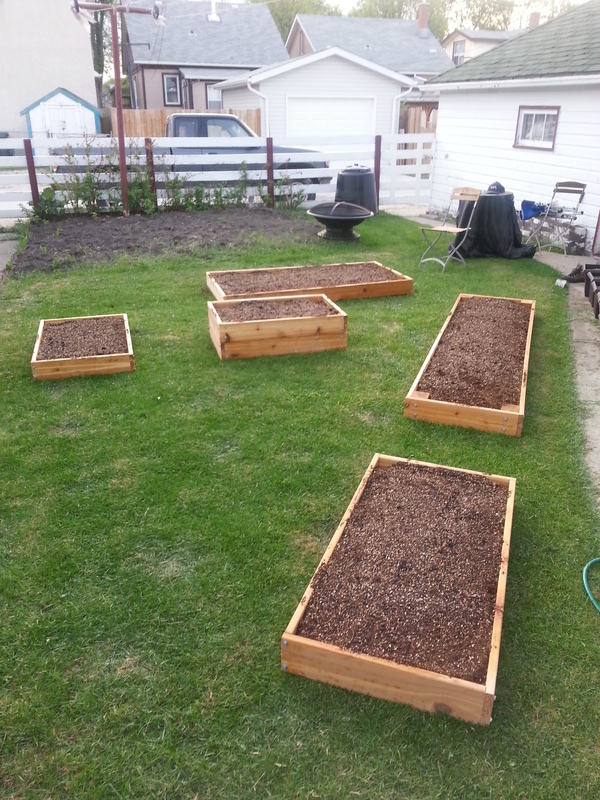 If you don’t do this right, you are not as likely to get the kind of success you should with square foot gardening. 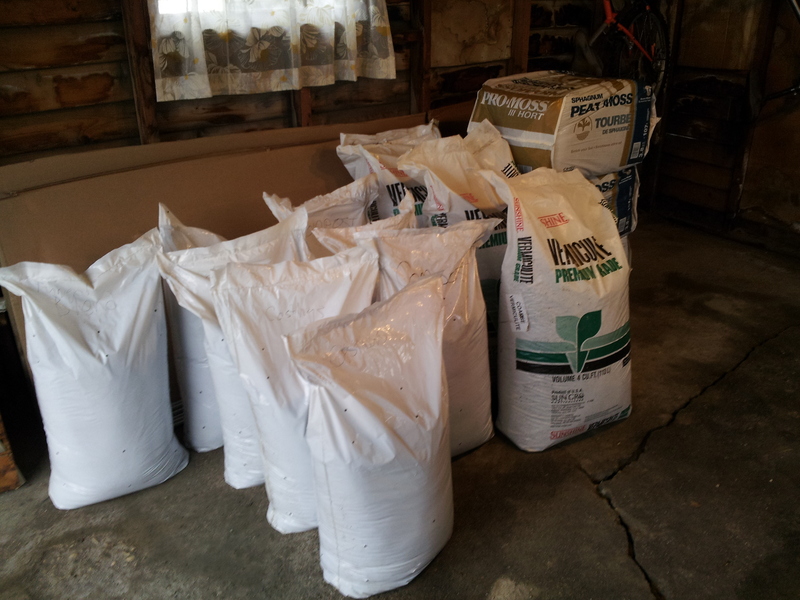 So we sourced our soil ingredients from a garden center and a local company providing high quality compost, and figured out the quantities needed in preparation for building and planting the garden. Those little plants growing in our basement soon needed a home! Next came gathering the building materials (the square foot gardening book has lots of information on construction). We chose untreated cedar so the boxes will be around for years to come. 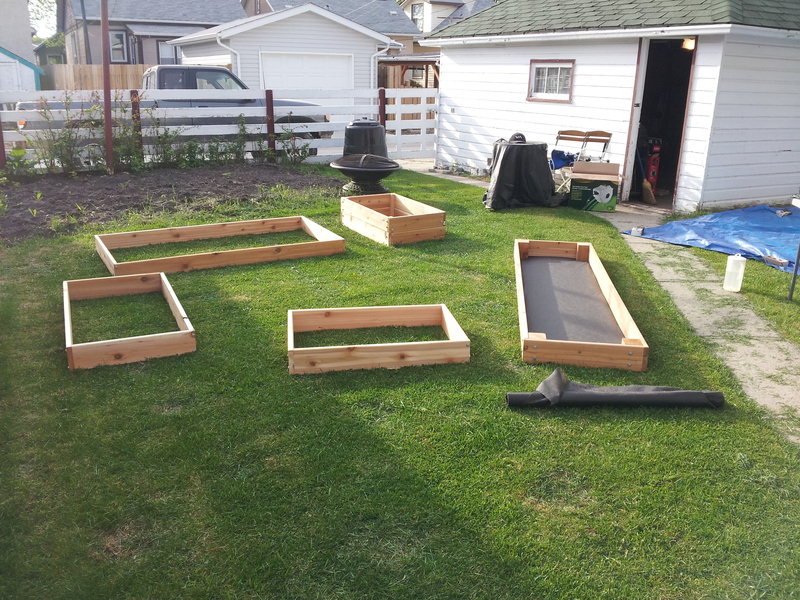 Cedar also smells amazing… We built the boxes according to the plans we made, put the weed cloth on the bottoms with a staple gun, and moved them around the yard into position. 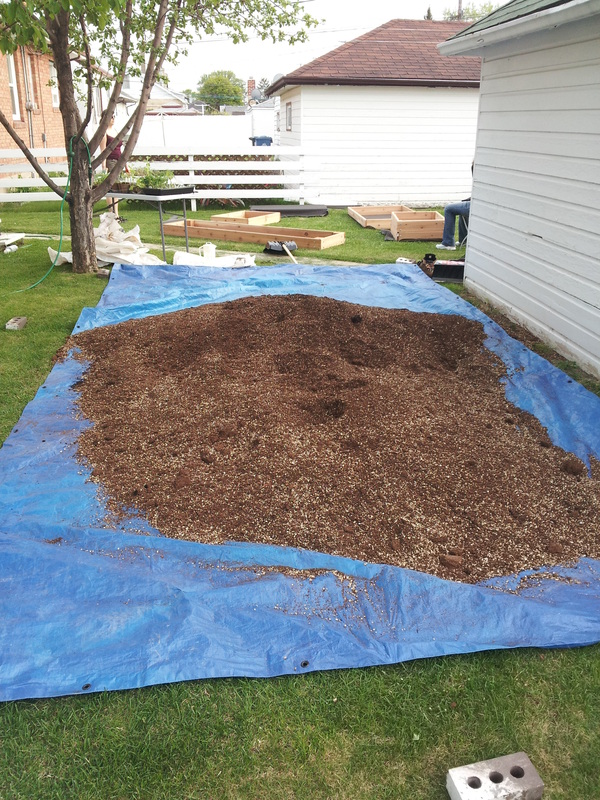 Once the boxes were ready, we blended our soil mixture on a large tarp so we could get ready to fill our garden boxes. After double checking everything was exactly where we wanted it, we filled the boxes. What a feeling of accomplishment! The hardest part was over. 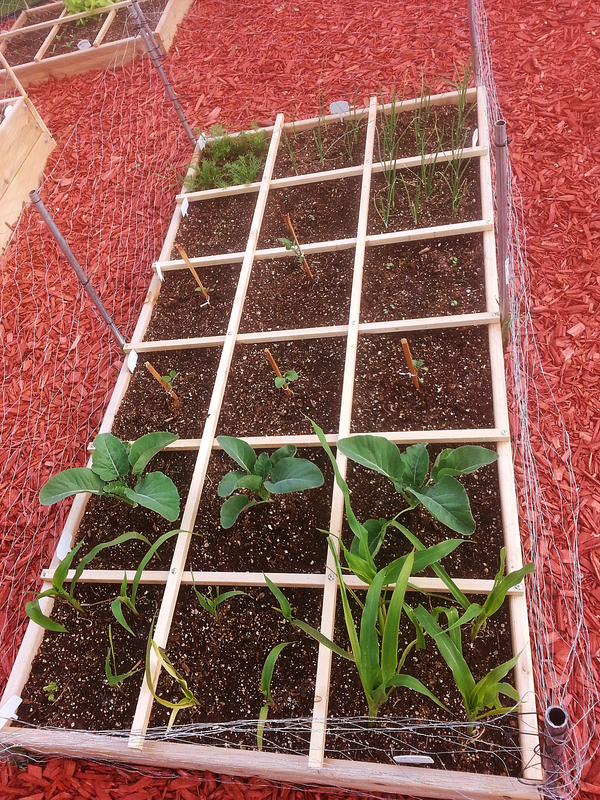 Before planting, the last step was creating “the grid”. 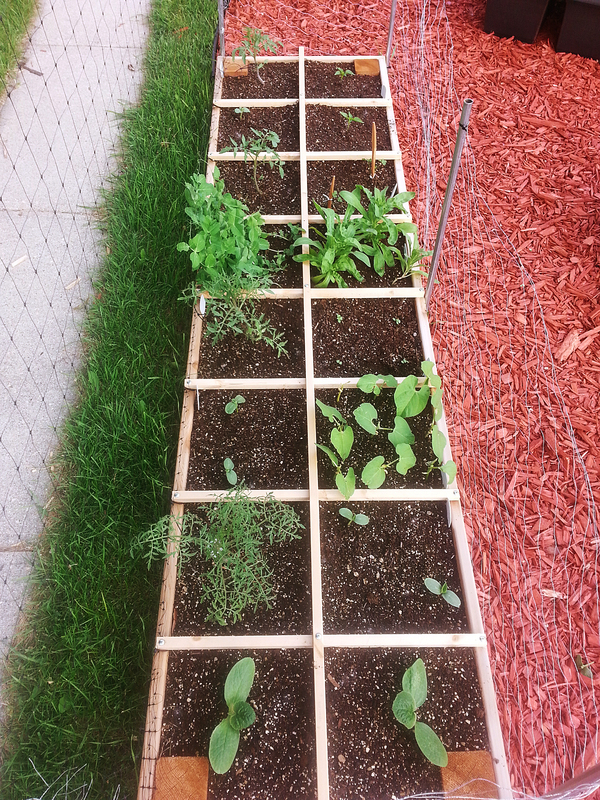 Also very important to square foot gardening. You need to see where each square foot is in your boxes. 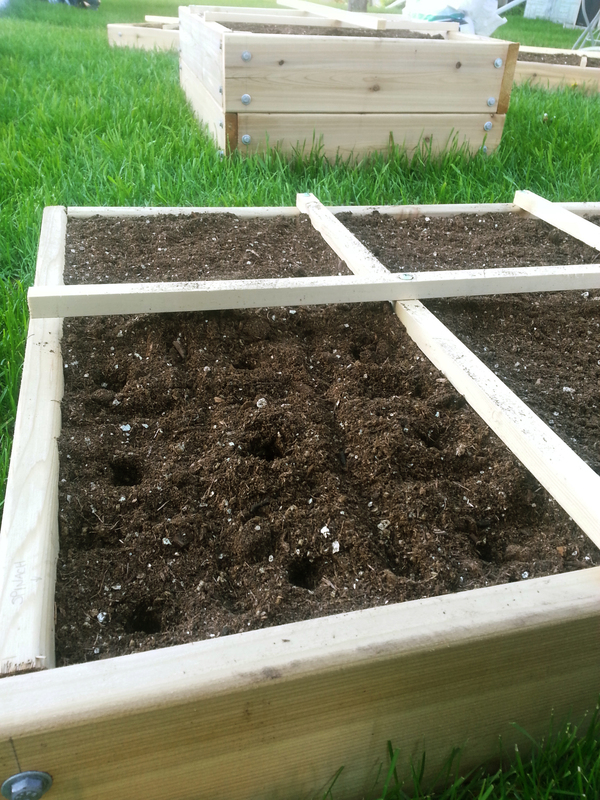 It made planting seeds and transplanting with the proper spacing a breeze (and can I even say…fun?). We used sturdy, small strips of wood to create our grids for the boxes. Now our plants could settle in their homes. And boy, did they grow. 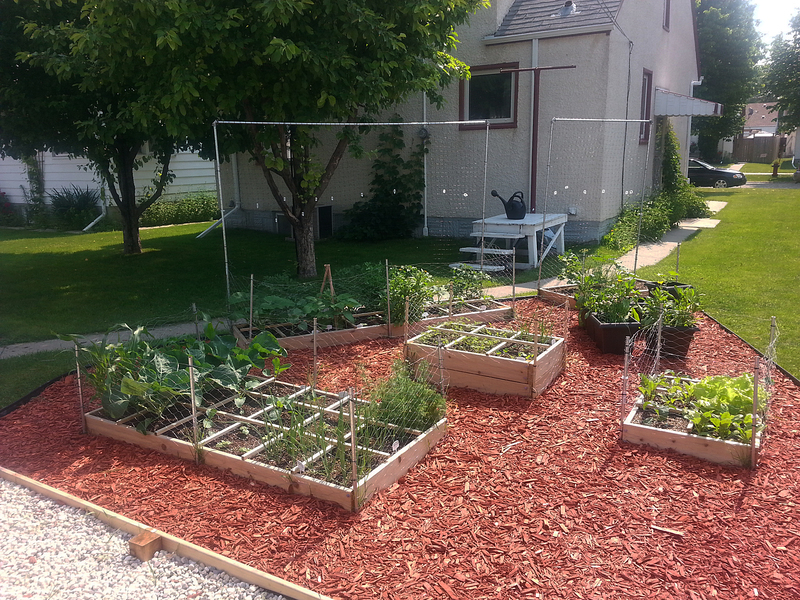 We put up trellis to support any crops that can grow vertically. 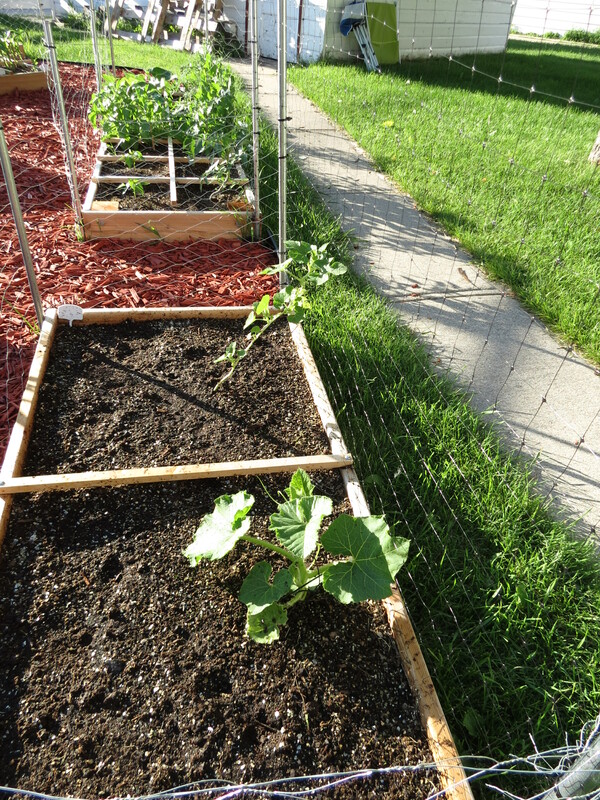 We also enclosed each box with chicken wire to keep the rabbits out. Finishing touches were added to our yard. It really brought the whole thing together. 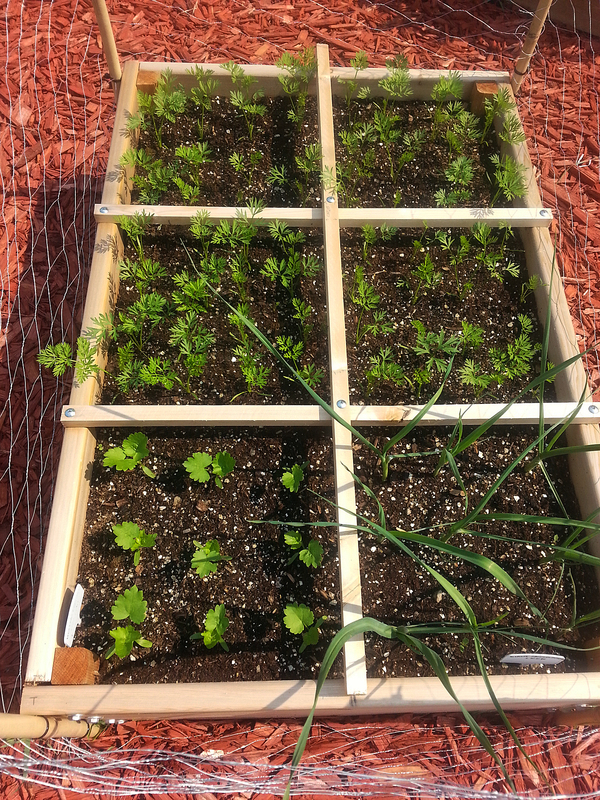 From top: chamomile, green onion, onion, oregano, broccoli, basil, cabbage, corn. From top: tomato, pepper, cucumber, tomato, parsley, peas, calendula, tomato, basil, cucumber, bush wax beans, more tomato and cucumber, zucchinis. 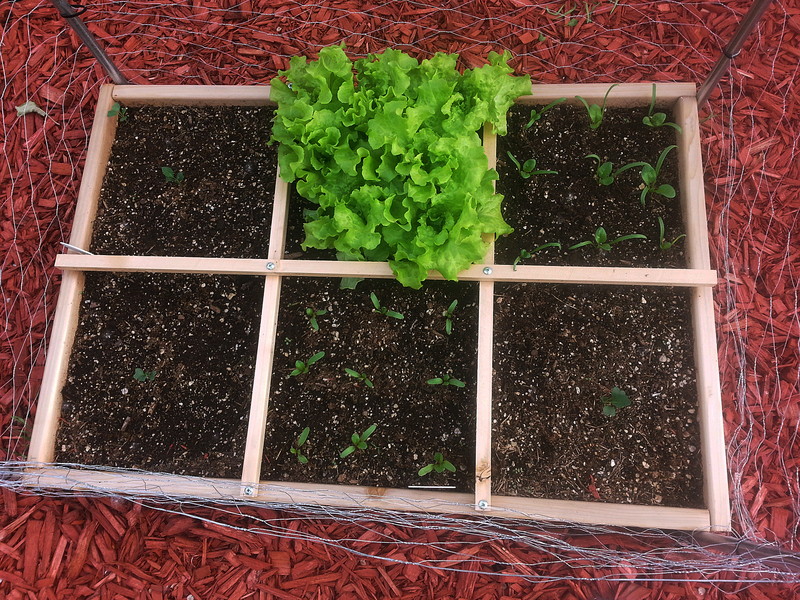 Square foot gardening in pots. 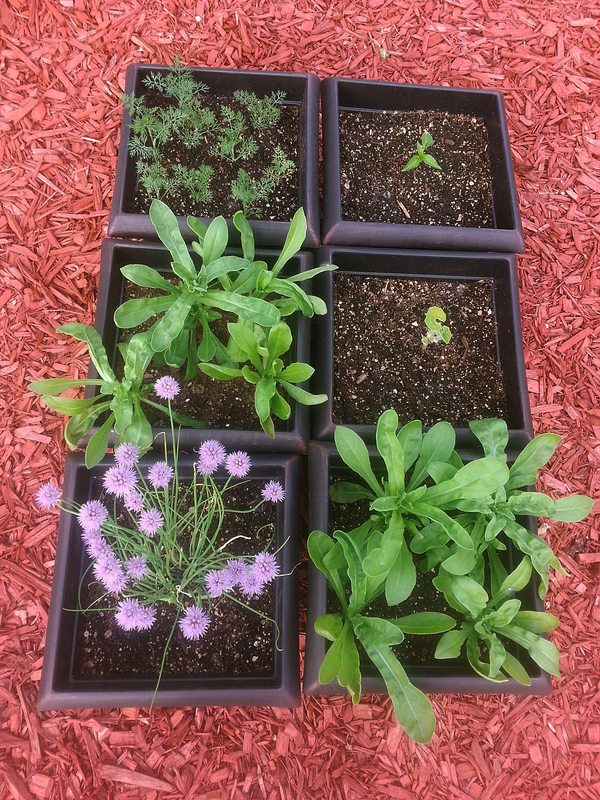 Dill, pepper, calendula, pumpkin, chives. The pepper loved growing in a pot, while the pumpkin wasn’t happy and died. The root crops such as carrots, parsnips and leeks required a deeper box to grow. Pumpkin and spaghetti squash. These required 2×2 squares for each. End of July. What a difference 1 month makes! 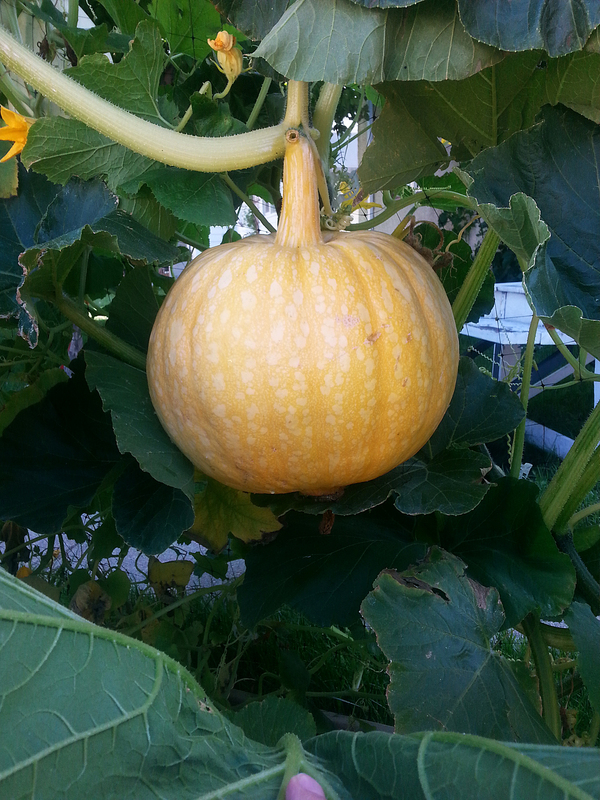 Ever see pumpkin and squash grow vertically? I was pretty proud of these beasts. 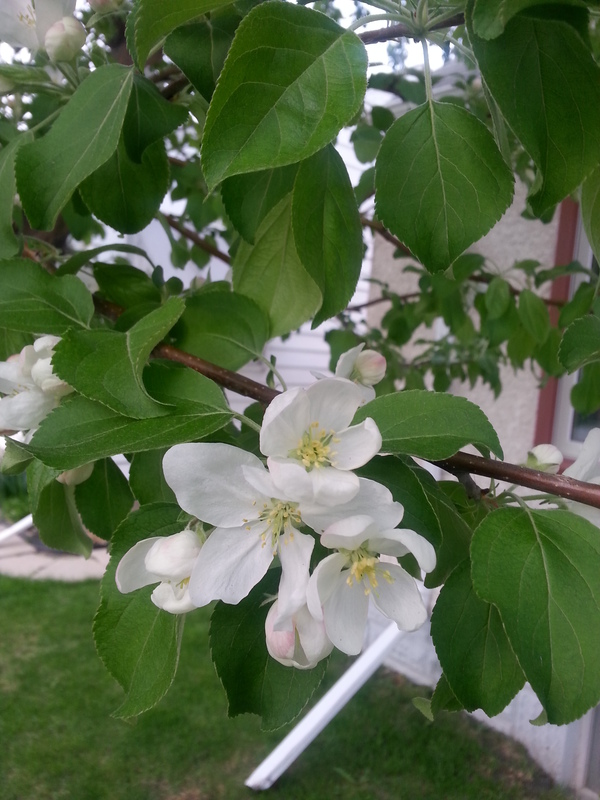 Did I mention our house has apple trees!? How perfect for us. 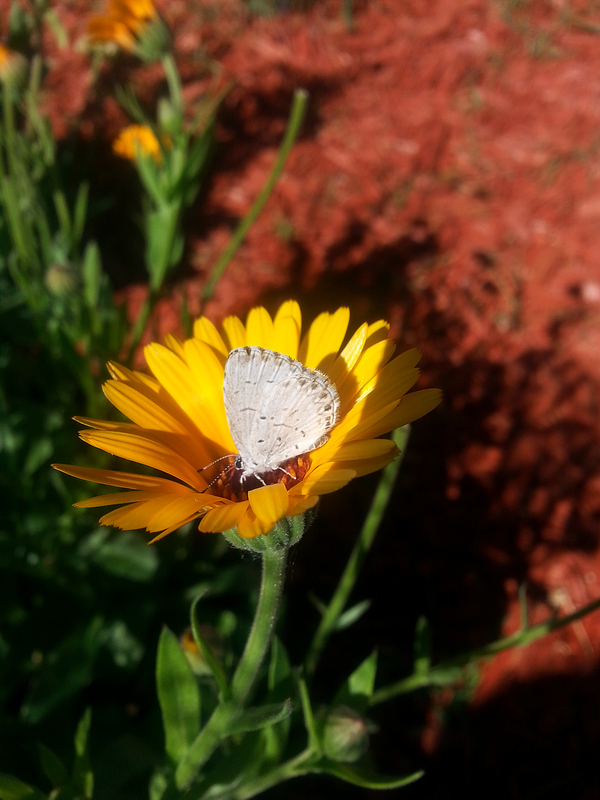 These were the blooms we saw while we first planted our garden back in May. 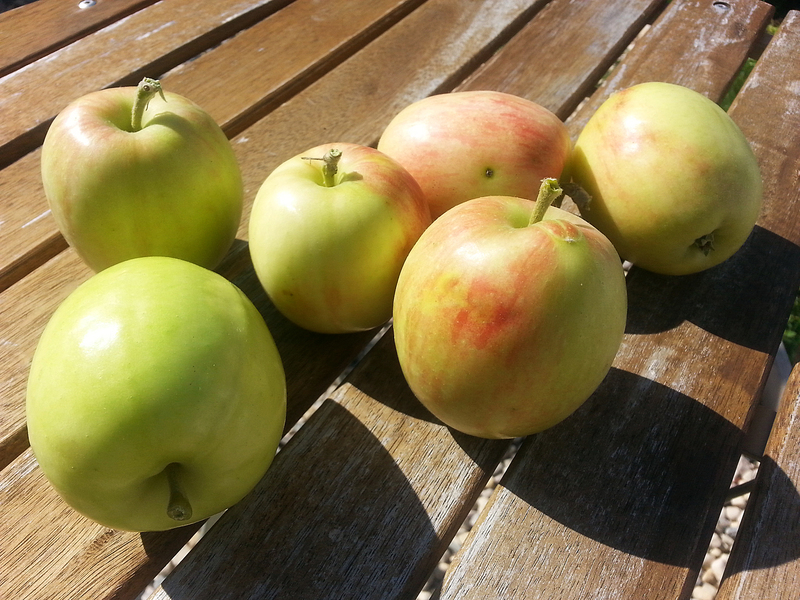 Gala apples. The other tree is Golden Delicious! 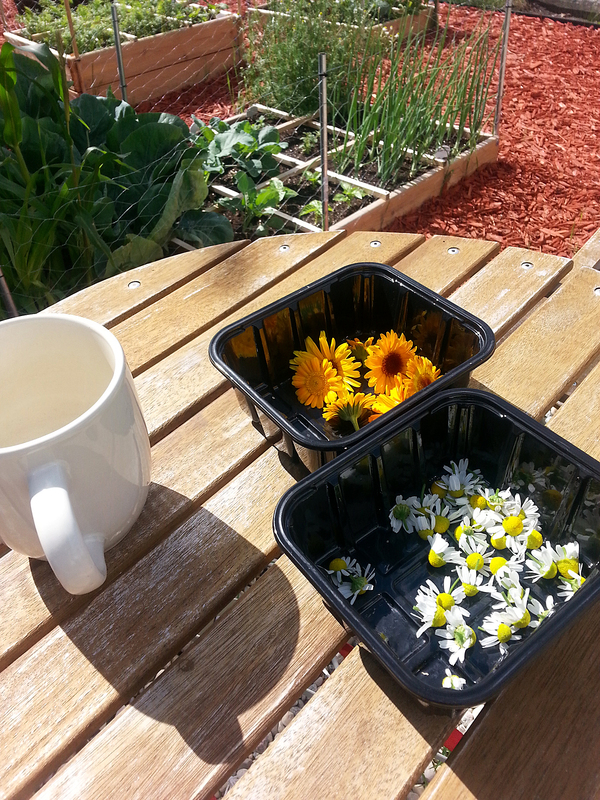 One of my favorite things was coming out to the garden in the morning with my coffee and caring for the garden, harvesting, etc. A great way to start the day. 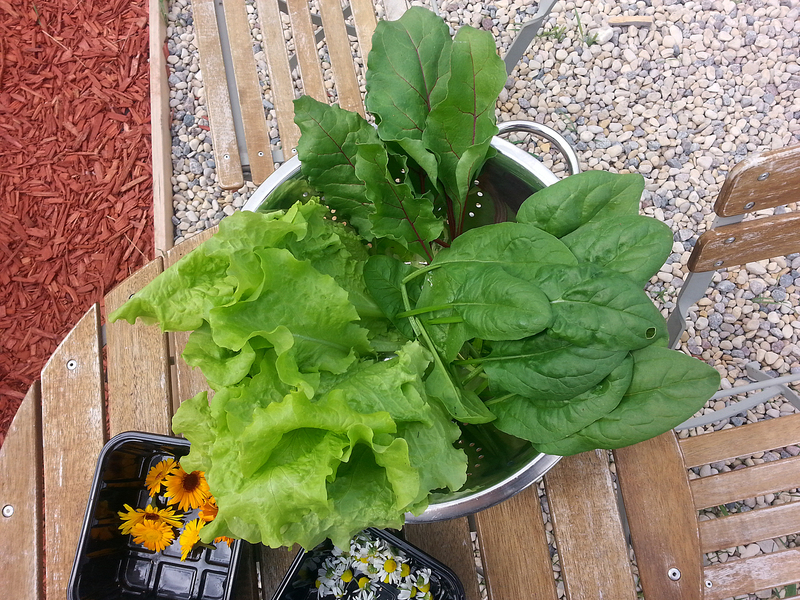 Harvest of lettuce, spinach, beet greens, chamomile and calendula. 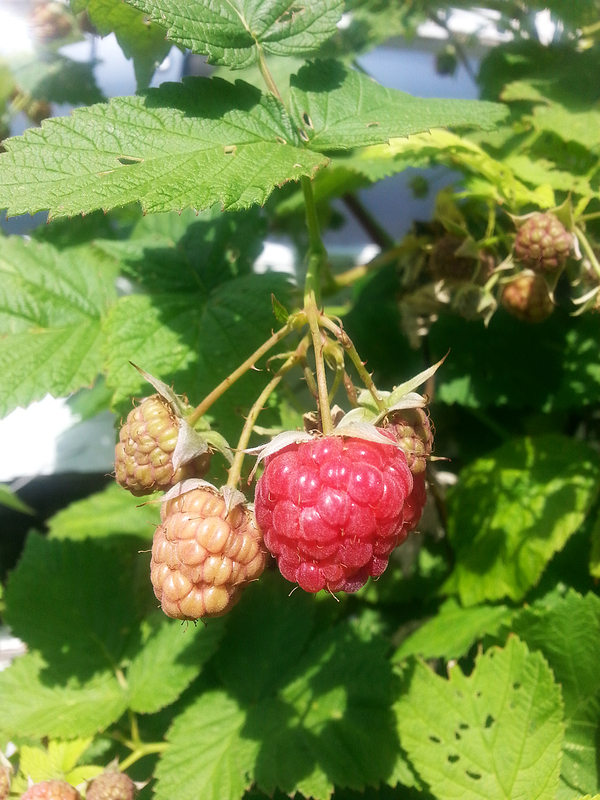 Our home also came with raspberry bushes! 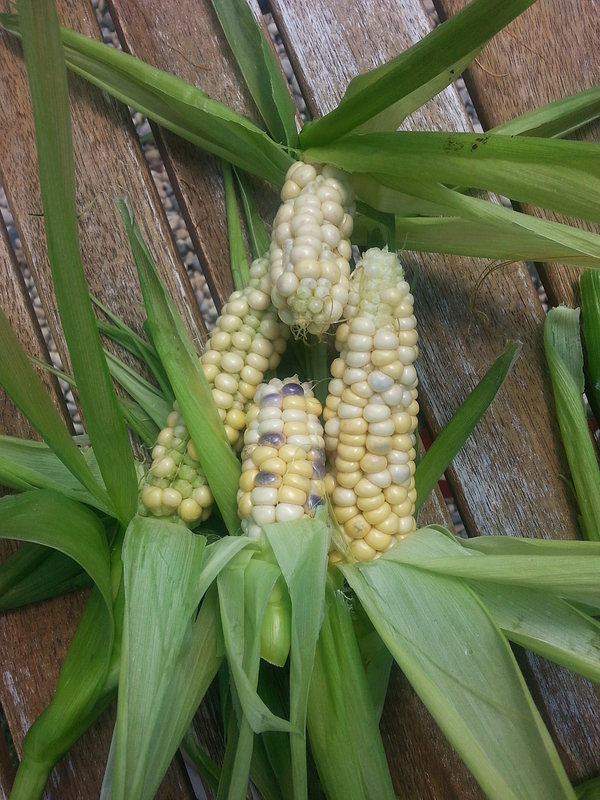 The corn cobs didn’t grow very big. I’m not sure if they were worth the space. However, non-GMO corn is difficult to find, so growing my own might be the best option. 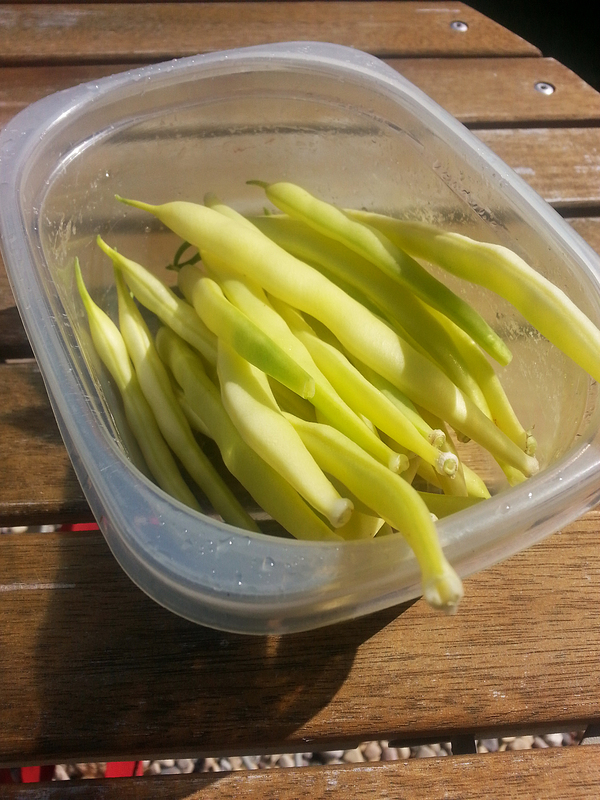 Yellow wax beans. Our one square foot of beans produced a lot and I will grow an additional square next time. We got one GIANT (34 pound!) pumpkin from our plant. Next time I plan on growing small sugar pumpkins, but how impressive is this!? 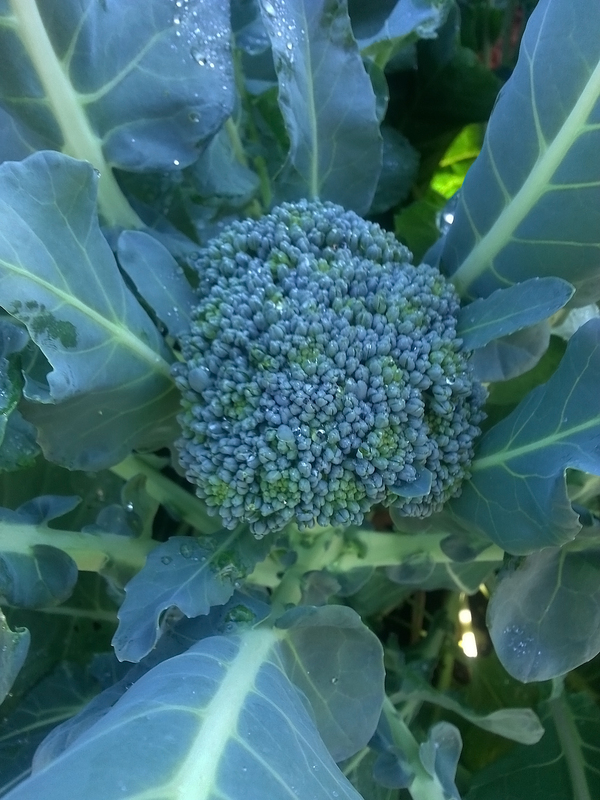 We grew several broccoli, cauliflower, and brussel sprout plants. 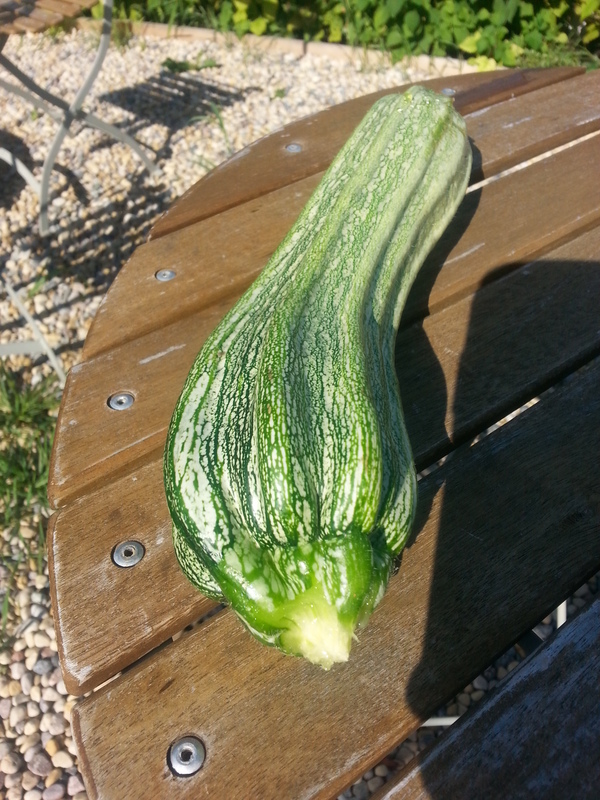 The plants got enormous and we only had one plant produce a head. Sad face. Next time I won’t grow these. They would probably be better off grown in the front yard; not crammed into one square foot of the garden where they shade out other plants. I loved the look of these zucchinis. Heirloom vegetables are the best! We got tons of them from our two giant plants. 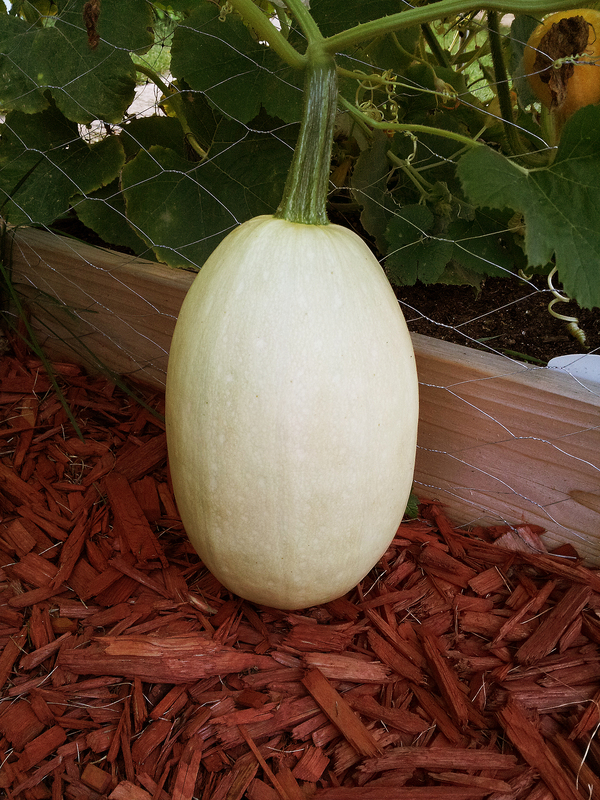 We got about 5 spaghetti squash from one plant and they were amazing. 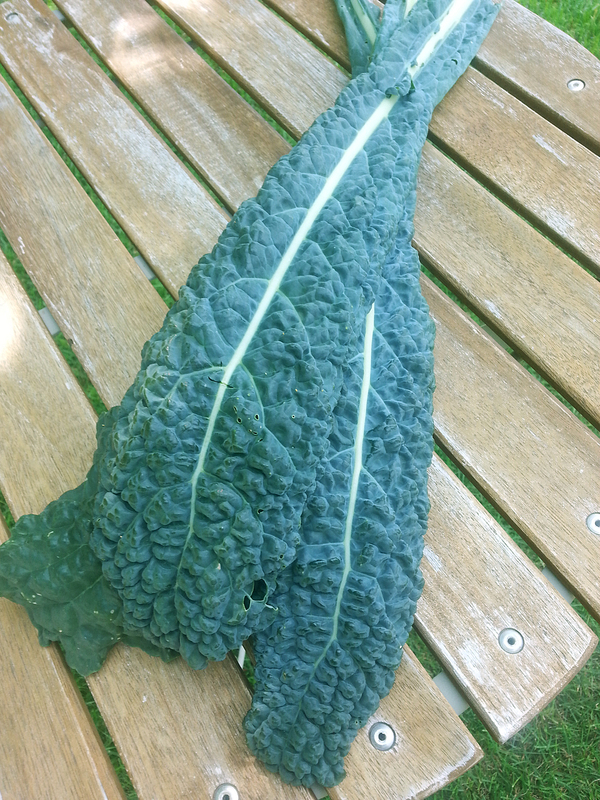 We had a ton of dinosaur kale. 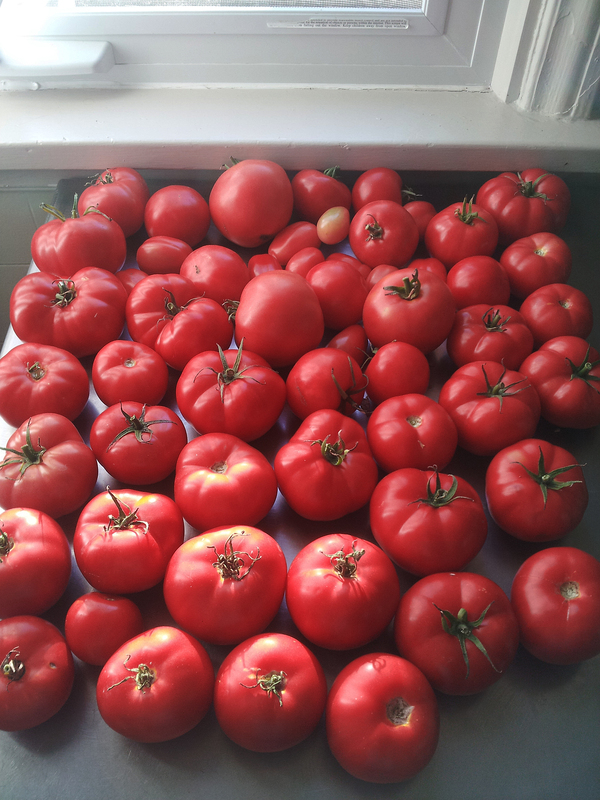 The tomatoes were destined for salsa and sauces. 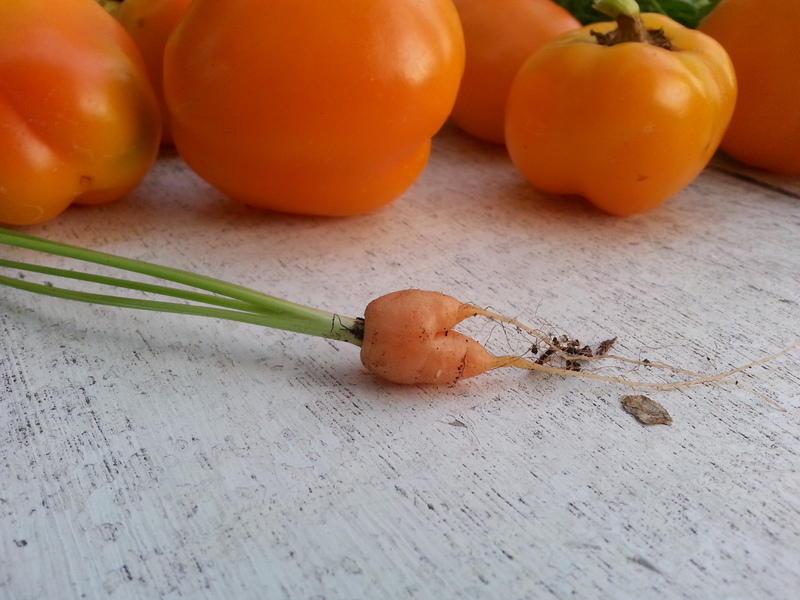 A tiny carrot with small sweet peppers in the background. 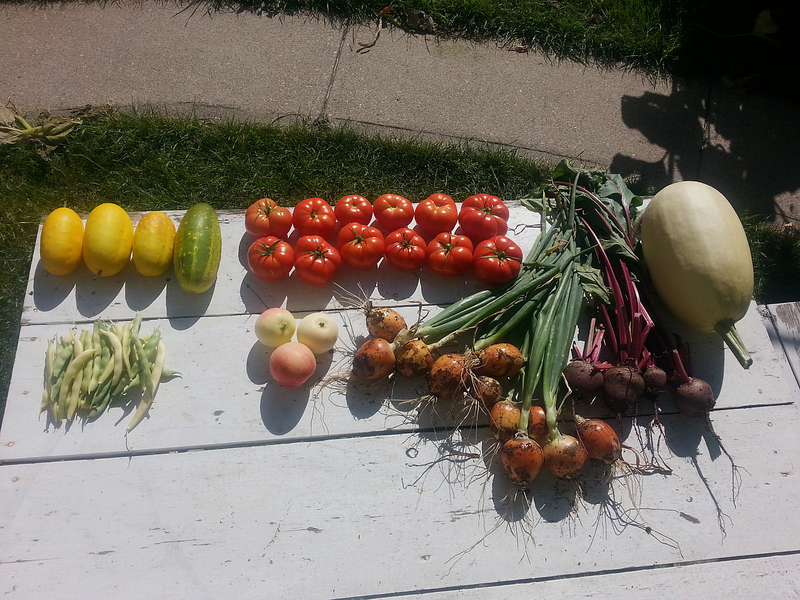 Harvest of cucumbers, tomatoes, beans, apples, onions, beets, and squash. Last harvest of the season as the frost was on its way. 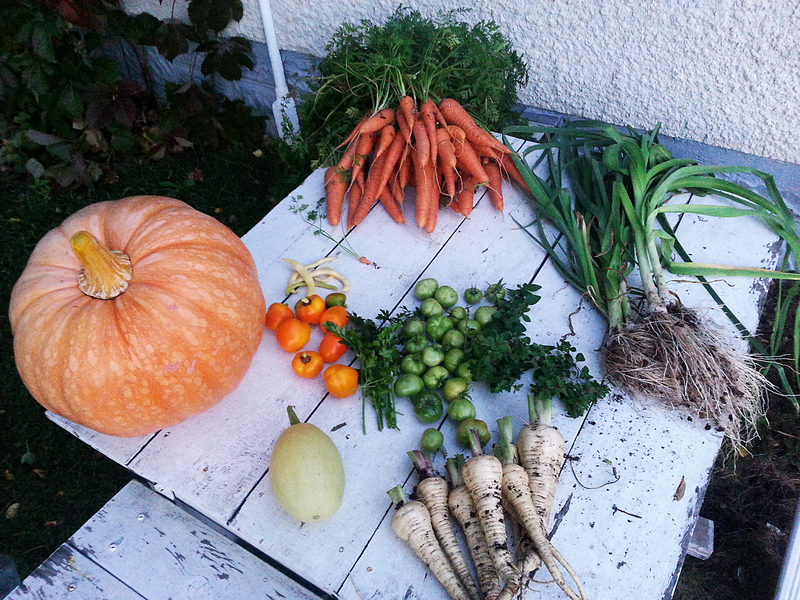 Pumpkin, carrots, peppers, beans, herbs, leeks, squash, parsnips. 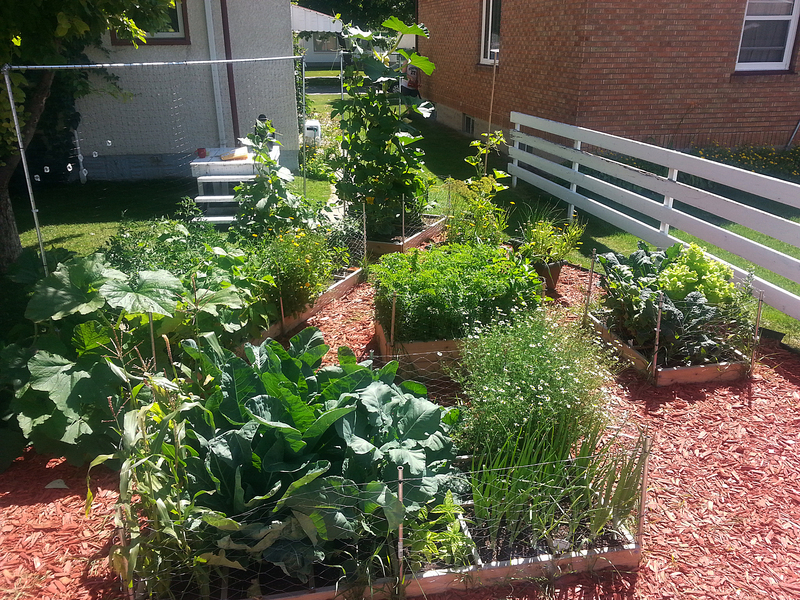 Are you going to try a square foot garden this summer?